The concept of a signature grape for the Hudson Valley has long been one on the minds of many of the region’s wine growers, but it was a casual conversation and a tasting of Glorie Farm Winery’s Cab Franc at a wine event that sparked winemakers, Doug and MaryEllen Glorie, and publishers, Robert Bedford and Linda Pierro, to consider the adoption of Cabernet Franc as the calling card of the region. They formed the Hudson Valley Cabernet Franc Coalition in 2016 armed with the support of other local growers, winemakers, and industry organizations. 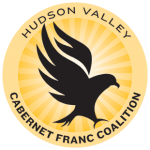 The Hudson Valley Cabernet Franc Coalition’s mission is to showcase the many high-quality, terroir-driven Cab Franc wines produced by a growing number of dedicated winemakers, and to encourage more plantings of Cabernet Franc vines throughout the Hudson Valley. The Hudson Valley Cabernet Franc Coalition is a 501(c)(6) non-profit corporation. Look for this bottle sticker on signature wines! Wines with the Coalition’s hawk icon on the neck of the bottle are authentic Hudson Valley Cabernet Franc wines. These high-quality wines are produced by the Coalition’s Legacy Members and adhere to strict standards of production that raise the bar to define the true character of Hudson Valley Cabernet Franc. The sticker guarantees that a minimum of 85% of the grapes used in making the wine are grown in the Hudson Valley and that the wine has been aged for at least 12 months. The hawk symbol represents the unified commitment of Coalition Members to grow and produce Cabernet Franc wines that capture the region’s terroir in every sip. More than a casual visitor to the Hudson Valley, a diverse variety of hawks can be seen soaring over fields and open spaces, nesting high up in trees that overlook many of the region’s vineyards. These powerful creatures are a beneficial aid to farmers to reduce crop damage and to keep other pests in check, and are a welcome indication that a vineyard’s ecosystem is healthy and balanced. An increase in sightings of these regal raptors late in summer can even signal the coming of a fruitful harvest! The Coalition’s mission is to encourage more vineyard plantings of the Cabernet Franc grape and boost recognition of the Hudson Valley’s distinctive Cabernet Franc wines. Special promotions and events will be announced to promote the region’s terroir-driven Cab Francs. Support the Coalition! Take part in these activities and support the efforts of its members to claim Cabernet Franc as the signature grape of the Hudson Valley. Click here to contact us. Doug and MaryEllen Glorie have been active in the Hudson Valley wine scene for many years. They are passionate about agriculture, and Doug has been growing wine grapes since 1983 on Glorie Farms. In addition to producing estate grown wines, Doug also supplies grapes to many wineries in the region. Their approach to making Glorie wines has been influenced by their extensive travels to wine regions in Portugal, Italy and France, throughout New England and the Mid-Atlantic states, and primary wine regions on the west coast. Doug is a founding member of Hudson Valley Wine and Grape Growers Association. He is also an active member of New York Farm Bureau, Cornell Cooperative Extension, and the Hudson Valley Research Lab. He currently serves as President of the Hudson Valley Cabernet Franc Coalition. MaryEllen has been active in the Shawangunk Wine Trail since Glorie Farm Winery joined in 2006, assuming responsibility for recruiting Tourism Partners and producing the annual brochure from 2009-2012, then serving as President for three years, 2013-2015, and continuing to serve as Vice President in 2017. She currently serves as Treasurer of the Hudson Valley Cabernet Franc Coalition. Bob Bedford and Linda Pierro are media, marketing, and publishing professionals with experience that spans decades and across several disciplines, working with large-scale national companies and smaller regional brands. Passionate about the Hudson Valley’s art, craft, and culture, in 2007 the couple founded Flint Mine Press, an independent publishing group with a mission to produce books and publications that celebrate the rich history and flavor of the region. In 2008, they founded Hudson Valley Wine Magazine, a definitive resource that supports and promotes the vibrant local wine and craft beverage industry, and winner of several industry awards. In 2016, the couple launched the Ultimate Hudson Valley Cider + Apple Spirits Guide. Bob brings his experience as multi-media producer in the corporate arena to his role as Executive Editor of Flint Mine Press. He has co-written and edited numerous articles and books relating to craft beverage history, and is the author of The Story of Brotherhood, America’s Oldest Winery. Bob’s historical acumen and photographic editing skills to help distinguish Flint Mine Press’s books and publications. Bob currently serves as Vice President of the Hudson Valley Cabernet Franc Coalition. Before her current roles as Managing Editor and Design Director, Linda garnered decades of experience as Creative Director at NYC-based design and marketing firms, including a business in Manhattan she co-owned and operated for more than 20 years. At Flint Mine Press, she is responsible for overseeing content development for Hudson Valley Wine and the Ultimate Cider Guide, and shapes the look of every published work. She recently established Flint Media Inc., a design and consulting company in the Hudson Valley that specializes in identity and promotion. Linda currently serves as Secretary of the Hudson Valley Cabernet Franc Coalition.